I took Arayo to the Chapel this week. As the bitter January winds blew, we walked the cherub-lined walkways towards the building that once drew crowds. Like visiting an ancient European Castle, the walls and beauty remain, but only the ghosts speak of the pageants, crowds, and glorious days of not so long ago. The spirits remind me of my first visit to this hillside. There was only a simple home here then, and the shy woman I met flinched when I asked of rumors that a chapel was to be built. "You'll have to ask Sam about that," was all she would say. Sam was her husband. Sam Butcher. The creator of the most collected figurines in the country: "Precious Moments." The Chapel - his tribute to God. No one who has ever met me would imagine that, tucked in my past was a period where I ran around giving presentations on these sweet, religious cherubs. That I was once married under a bridge with a 20 foot concrete troll looking on is understandable. But gooey angels? 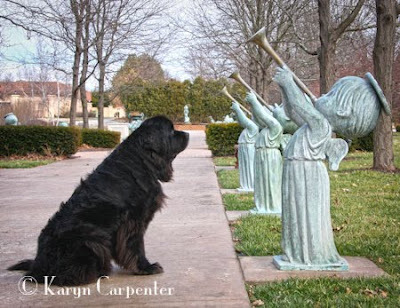 For 7 years I traveled the Midwest, my Newfoundland dog, Tara, by my side. Meeting with groups of "clubbies" - collectors who had anywhere from 10 to 1,000 of the figurines which proclaimed their messages of Jesus, love and glory to God. Though I think the collectors always knew I wasn't a Precious Moments girl down in my soul, I adored the "clubbies" for their genuineness and gentle spirits, and ended up with groupies who followed me from venue to venue. 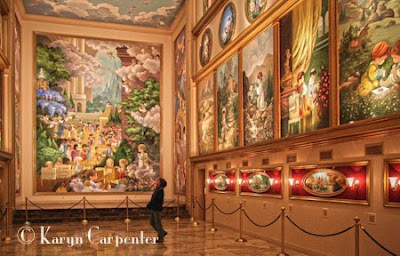 As I walk toward the chapel, I recall its construction, its painting and the crowds of people who made their way to stare in wonder at the stories the paintings on the walls portray. I remember the conventions I organized, and of helping protect Sam, the shy soft-spoken artist, from the mobs who wanted to meet the man they so adored. Today, the parking lots are nearly empty, and the tour guide says the masses have dwindled to a handful of people who visit each day. No longer are the roads jammed with tour busses, and Sam is probably free to walk around unconcerned with crowd control and body guards. The Precious Moments Chapel is still beautiful and well worth a visit. It is a simple but talented man's tribute to God and in its own way, a tribute to those who collect or once collected. It is a gift from a wonderful man who had a vision that changed the face of a small hillside in Southwest Missouri. Perhaps, if you are lucky, when you are there you can still hear the ghosts of a glorious time gone by. Photos: My cousin, Megan, admires the inside of the Precious Moments Chapel. Arayo visits with Precious Moments Figures on the Chapel Grounds.